Lie back on a bolster or several blankets folded lengthwise to support your back and head. Bend your knees out sideways and bring the soles of your feet together, with your heels as close to the pelvis as possible. Let your back settle and your chest open. Relax your inner legs and your arms out to the side of your body. As a beginner, stay in position for 1–5 minutes, breathing evenly, with your eyes closed. With more experience, you can stay in position for up to 10 minutes. 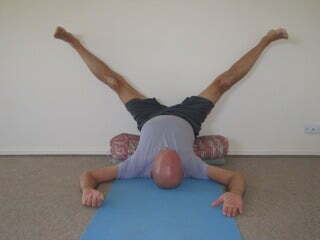 Supta Upavistha konasana Lying-down splits – Equipment: blanket/bolster, wall. Lie on your back near to a wall. Bend your legs and wiggle your buttocks as close as you can to the wall. Straighten your legs on the wall and move them wide apart into the splits. Adjust your feet so they are equidistant from the floor. Let your legs relax outwards. Your arms can be loose by the side of you or folded overhead. Hold the pose for 3-5 min. breathing evenly. Supta Padangusthasana – Equipment: Belt and Blanket. Lie down on your back with your legs straight and together. Rest your head on a folded blanket. Bend your right leg in towards the outer right chest, and using both hands, hug your leg to your chest. Keep your left leg straight, with the back of your thigh and knee on the floor. Hold the pose for 10 to 15 long breaths, then, change legs to repeat on the second side. Release for another version of the pose. Slip your belt over the ball of your right foot and straighten your right leg towards the ceiling. Hold the belt with both hands. Keep your chest open, your shoulders down, and your throat relaxed. Stay in this position for about 10–15 breaths and work on extending both your legs. Release, and change legs. Here’s one more version: Hold the belt with just your right and hand and extend your left arm onto the floor on the left side, palm upwards. Take your right leg out to the right side in line with the right hip, as much as possible, and about half way to the floor. Keep your left leg hip on the floor and turn your left thigh turned in. Work on keeping both legs straight. To avoid rolling your trunk over to the right, keep your navel turning to the left. Your chest should also be turning. Hold this extension for about 10 to 15 breaths. Bring your right leg back up to the vertical, and then gently release it alongside your left leg. Repeat on the second side. Ardha jathara parivartanasana Belly twister – Equipment: 2 blankets or cushions. Lie down on your back and stretch your arms out sideways so they are in line with your shoulders, palms up. Bend your knees into your chest. Exhale and take your knees down to floor on the right side, pointing towards the right armpit. If your knees don’t quite touch the floor, let your bent legs rest on a folded blanket or cushion to the right side. Keep extending your left arm and revolving your abdomen to the left. Press your left shoulder down if it is lifting off the floor. Hold the pose for 15–20 breaths, then, bring your knees back to the centre again. Repeat the pose, this time taking your knees down to the left side. Hold the pose for 15–20 breaths, then, bring your knees back to the centre. Repeat the pose once more on each side. 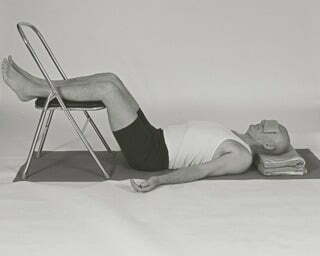 Lie down and lift your lower legs onto the seat of the chair. Move your buttocks in close to the chair and rest your arms by your side. Support the back of your head and neck with a folded blanket. Cover your eyes with an eye bag or soft cloth. Stay in the pose for 5–15 minutes. You will find your breathing becomes very gentle and quiet.